Death to the mainstream discourse on Islam & Muslims! In this life, few things are more banal to me than the discussion about burqas. Even critiques of the burqa craze are beginning to seem passé. With everyone from Oprah to Deepak Chopra weighing in, one wonders what is left to be said and whether it is worth adding to the already-monstrous heap of commentary. Yet Muslims are endlessly challenged to explain the burqa and clarify what they think about it. This is largely thanks to the French government. Going beyond the proposals of the parliamentary report, Prime Minister François Fillon drafted a letter to the French Council of State requesting legal advice on how to enact the “widest and most effective” possible ban on burqas in France,7 and Jean-François Copé, the ruling UMP party’s head in parliament, advanced a draft law targeting the burqa which stipulates that “nobody, in places open to the public or on streets, may wear an outfit or an accessory whose effect is to hide the face”.8 This has all culminated in a 335-1 vote in the French lower house of parliament on a law to ban all face-covering veils in France and impose a fine of up to 150 euros ($190) on women found wearing them, as well as punish any men found to be forcing a woman to cover their face with up to a year in prison and a 15,000 euro ($19,000) fine.9 The French Senate is scheduled to vote on the law in September (2010). When most people talk about "burqas" in the European context, they're thinking of "niqabs"/"niqaabs". For simplicity's sake, I generally refer to the "burqa" here since the discourse has already been framed using that word. Despite having lived in France for generations, Muslims are not considered French by many so-called "French French" people. In the U.S., this series of events (as well as prior controversies over the Muslim headscarf in French schools during the 1990s) has sustained a seemingly endless stream of news editorials and internet commentary. Despite the large amount of attention garnered, there seems to be something conspicuously absent from the conversation. Between impassioned cries about women’s rights, secularism and the freedom of religious expression, there remains a deafening silence about France itself. If France is mentioned (that is, in any capacity beyond the most pedestrian American fantasies about “Paris”, “French women”, “fine art” or haute couture), it is in the vague context of “French values”, laïcité (French secularism) or the welfare state. Within the debate, it is unclear whether France is a place or simply a political idea. This, however, is precisely the purpose of the burqa discourse: it conveniently frames the challenge of French Muslim integration as a problem of religious and cultural difference. The discussion then gets deflected into the abstract realms of political philosophy and Qur’anic exegesis, avoiding any exploration of what life is actually like for Muslim women in France. At every turn, the French Muslim experience is downplayed and obscured. The obstacles to French Muslim integration, symbolized by the burqa, are invariably dissociated from French society and instead ascribed to foreign customs (“Arab/Muslim culture”) or globalized politico-religious movements (“Salafism”). What Sarkozy and his cabinet are loathe to admit is that the very French problems of residential segregation, inequalities in the education system, staggering unemployment and widespread social exclusion represent barriers to Muslim women that are far more opaque than the fabric of any garment. But drifting aimlessly in the world of the symbolic and having lofty “debates” about “what it means to be French” is an ingenious way to avoid the thorny, concrete questions of the structural. By zeroing in on the burqa, Sarkozy and others have managed to construct a discourse on French Muslim integration that precludes almost any consideration of France itself. A woman walks through a French cité. 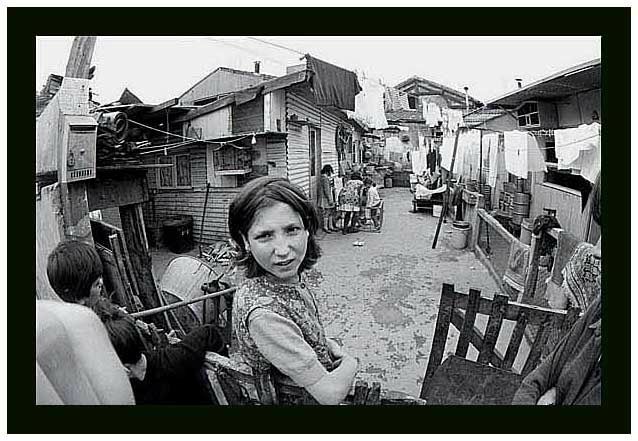 A bidonville in Aubervilliers (near Paris), 1957. This was considered cutting-edge when it was built. The architects, no doubt, never had to live in these hideous boxes. Gradually France’s subsidized housing estates fell into disrepair. After decades of neglect, their infrastructure began to crumble, as did the prospect of social or economic mobility for remaining residents. As the suburban projects became catch-alls for the most marginalized and excluded of French society (largely but not entirely immigrants and their children), commercial and state services receded and problems of petty crime and poor security compounded. Suburban unemployment and unrest has been a problem in France for decades. Out of sight, out of mind, out of luck. This is not a banlieue. It is a French internment camp. You might have confused the two. If the challenge of “integrating” French Muslims appears to be a throwback to the old colonial paradox (to ‘civilize those unable to be civilized’), it is only because people have made it that way themselves by defining France’s “integration” problem as a question of culture and religion rather than social immobility, housing policy and educational inequality. Discussions of the banlieues themselves can also get transformed into complaints about culture (e.g., “speaking in slang”, wearing hats backwards and the like). Until the real issues are addressed, and people stop framing the discourse on French Muslims as a cosmic clash of religion and secularism, things will only get worse. Perhaps, in time, it will be a self-fulfilling prophecy. But I’d bet a thousand francs that you won’t find the answer hidden beneath any burqa. Wow, that was pretty long. It’s been a while since you went elaborate in your posts. Excellent post. There was a lot that i found illuminating, you obviously went gung-ho with the research! This sounds a lot like something out of the mouth of Tim Wise, when he talks about white privilege prevailing in the US government and even US society. While i do agree with you 100% about the relative irrelevance of the burqa to the integration of the North African immigrants to French society, I was wondering what you thought about the group Ni Putes Ni Soumises and their endorsement of the burqa ban. Truth be told, i don’t know that much about them, mostly because i don’t know that much french, though they seem to be a very decent organisation. Thanks. haha yeah I started writing this some months ago when I had a lot of free time. I tried to include photos and video to break up the text a bit. Fadela Amara and NPNS also supported the ban on headscarves in French schools in 2003. MashaAllah. Very refreshing and informative look, we need more writing from you barakAllah fiikum. Far too often we get caught up in emotional responses and it is a more thoughtful and academic response that is needed to encapsulate the bigger picture and systemic challenges people are facing outside of a specific issue. Thanks so much for your kind comment – and I do certainly agree that it’s all too easy to react emotionally in counterproductive ways to things like this. It’s always a challenge! Great post! I also really liked the interspersed stats. this is such a good article, really useful as I’m having to write about the banlieues at the moment. Do you mind if cite you as a reference as you’ve got a lot of good sources in there? I am Estonian citizen who studies Government and Politics. We are currently going through France politics and your article has given me better view of France’ ongoing issues. Took me about few hours to go through this article and all the references. Thank you very much 🙂 I’m glad it was useful!